Now, admittedly, unicellular organisms are not very bright — but they are smarter than clocks and supercomputers. For they possess the rudimentary beginnings of that driven, active, compelling engagement that we call life and that we call mind. Machines don’t have information. We process information with them. But the amoeba does have information — it gathers it, it manufactures it. I’ll start worrying about the singularity when IBM has made machines that exhibit the agency and awareness of an amoeba. While Noë’s assertion is pretty questionable, amoebas are actually fairly complex information processing systems. So just how smart is an amoeba anyway? Smart enough to solve optimization problems and discover knowledge. Liang Li and Edward Cox at Princeton University reported that the Dictyostelium amoeba has a rudimentary memory a result which has been confirmed and the underlying mechanism has been potentially identified. Masashi Aono of the Earth Life Science Institute (ELSI) in Tokyo demonstrated that slime molds can solve the Traveling Salesman Problem, and Tanya Latty and Madeleine Beekman from the University of Sydney demonstrated that slime molds make irrational decisions like humans. 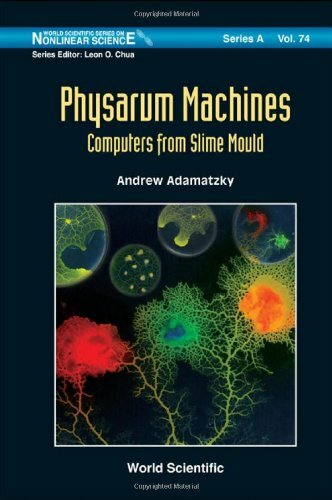 Andrew Adamatzky who is a Professor in Unconventional Computing in the Department of Computer Science and Director of the Unconventional Computing Centre, at the University of West England is another researcher of note in the world of slimy computing. He literally wrote the book on the subject of physarum computing and it’s worth a read if you want develop your own experiments. Perhaps the most realistic current application of physarum computing is in road planning and complex load balancing applications. Shown below, Dr. Adamatzky’s work with U.K. road networks. Beyond this, understanding the information processing capabilities of these simple organisms may lead us to novel and innovative computational algorithms and architecture,solve intractable problems, and help find cures for amoeba caused diseases. Want to learn more? Join the Mould Collective or just enjoy the collection of moldy videos below. Nakagaki, Toshiyuki, Hiroyasu Yamada, and Ágota Tóth. “Intelligence: Maze-solving by an amoeboid organism.” Nature 407.6803 (2000): 470-470. Munakata, Toshinori, Masashi Aono, and Masahiko Hara. “Amoeba-Based Knowledge Discovery.” (2010).